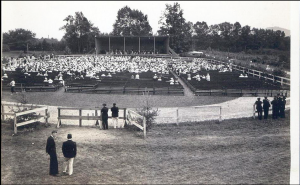 Despite the dark days of the Depression, conductor-composer Henry Hadley worked with Gertrude Robinson Smith and others to put together the first Berkshire Symphonic Music Festival in August 1934. 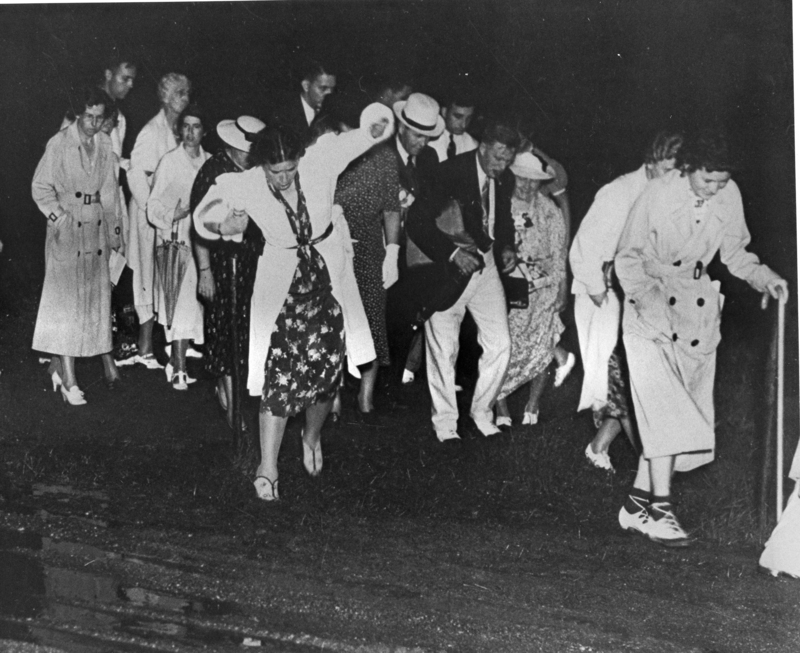 The three performances – August 23, 25, and 26 attracted about 5,000 including Sara Delano Roosevelt – the President’s mother. 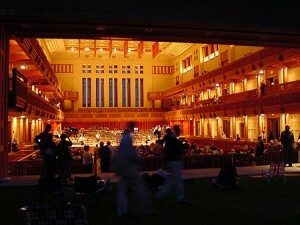 Held in the open, reviews included comments such as “Provision for everything has been made except, possibly, for the distant but luckless chauffeur who fell on his F sharp horn during a passage in D flat major.”* Certainly the atmosphere was more lighthearted than the usual indoor winter symphony performance. 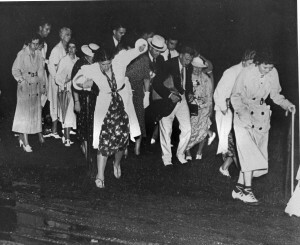 Overall reviews were good and Gertrude Robinson incorporated the Berkshire Symphonic Music Festival in the fall of 1934. 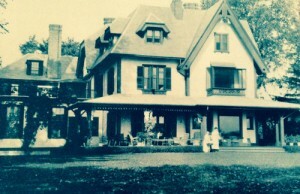 In 1935 the three day festival was again held at the Hanna farm. The performance included a larger orchestra and a local chorus of 300. Although it provided scant shelter, the second year included a large tent. Henry Hadley was too ill to continue and the Festival trustees sought a more permanent solution. They had the good fortune to perform a bond with the Boston Symphony Orchestra and their “hot” new conductor, Serge Koussevitzky. The third summer the performance was held at Holmwood (home of Margaret Emerson ). 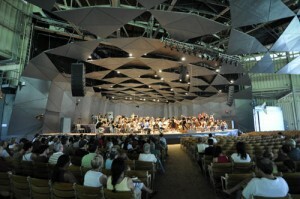 The famous orchestra and conductor drew an even bigger crowd – the attendance at the three performances was nearly 15,000. Koussevitzky was lobbying for a longer (six concerts over two weeks) schedule when the group received a remarkable gift. 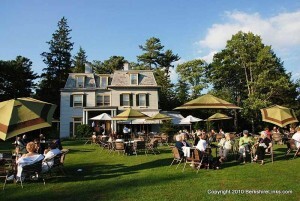 In 1936 Mrs. Gorham Brooks and Mary Aspinwall Tappan donated their summer home, Tanglewood to the Boston Symphony Orchestra. 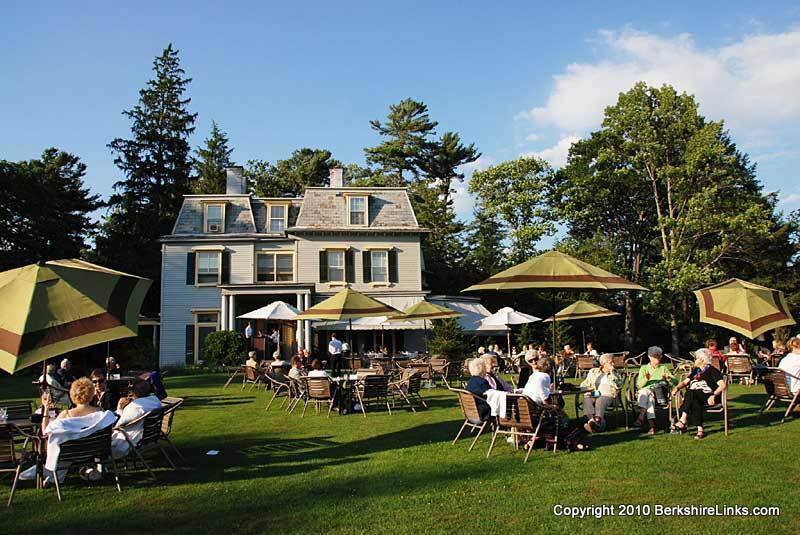 The home, outbuildings and 200 acres of lawn, trees and garden overlooking the Stockbridge Bowl provided a permanent home in a beautiful setting for the Berkshire Symphonic Festival. For the summer of 1937 Koussevitzky had expanded the schedule to six performances over between August 5 and August 15. The six 1938 concerts drew 38,000 from all over the country and abroad. 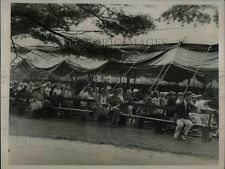 The Festival had come of age in four short years with a Western Union Tanglewood telegraph office on the grounds to handle the copy of the numerous newspaper and magazine writers in attendance and a national broadcasting hookup. From the beginning the Festival had set out to expand the reach of classical music beyond the confines of wealthy winter city dwellers. Educating and developing musical talent was an early goal. The informality of the shed and the expansive acerage contributed to this desired spirit of accessibility. Although it’s been a long time since anyone has seen a tent on the lawn, the effort to be open and democratic continues. Performances are staffed with volunteers and audiences can still get inexpensive lawn tickets and picnic under the stars (or an umbrella if necessary!). 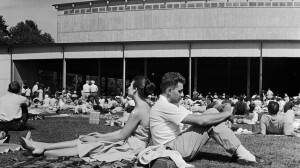 In 1940 the school of music – the Music Center – held its first session with approximately 300 students and the Festival was expanded from six performances over two weeks to nine performances over three weeks. By 1941 attendance had grown to about 95,000. As the Festival grew to national proportions touched off a rash of renting out rooms and starting up “Tourist Homes” and shops. The peaceful village filled with motor cars and must have touched off all the mixed feelings Lenox experiences today — cheering the business brought in by summer visitors but whining about the traffic. By 1941, the Theatre-Concert Hall, the Chamber Music Hall, and several small studios were finished, and the festival was attracting nearly 100,000 visitors annually. “Gala Benefits” were added that year to raise funds for war-related causes. The benefits included music and famous speakers (including Eleanor Roosevelt). War conditions forced cancellation of the 1942-1945 full Festival schedule. However the Music Center students performed in 1942 with benefits for Treasury War bonds and Russian relief. With the assistance of some members of the Boston Symphony Orchestra, Koussevitzky led a Mozart series at the Tanglewood Theatre Concert Hall in 1944 and a Mozart-Bach series at in 1945. 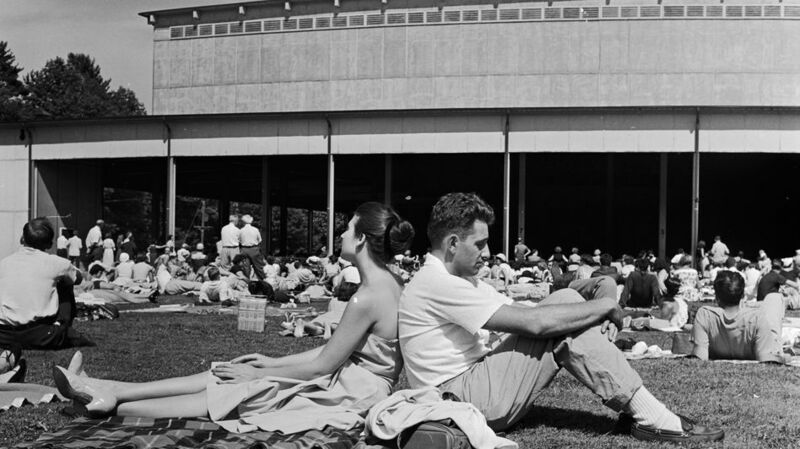 The Festival returned in 1946 with the full Boston Symphony Orchestra and a nine concert schedule. 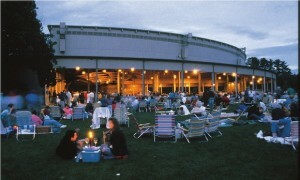 Tanglewood Music Center facilities. Inaugurated on July 7, 1994, Seiji Ozawa Hall provides a new venue for Tanglewood Music Center concerts, and for varied recital and chamber music concerts. Today Tanglewood annually draws over 350,000 visitors and continues to provide education and inspiration for young musicians.